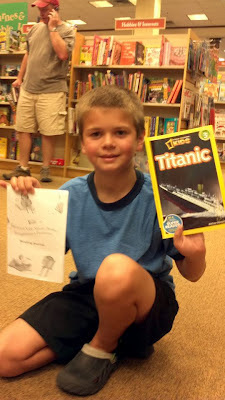 On Saturday the kids and I went to Barnes & Noble to turn in their Summer Reading Program log so they could pick out their free book. It's a great program- you download the log, write down 8 books as they read them, and when you turn it in, your child gets to pick out a free book from a selection chosen by Barnes & Noble just for the reading program. WC, who was unwilling to pose for a picture, chose Fancy Nancy: Fancy Day in Room 1-A, which was the only FN book we didn't have at home. Fancy Nancy never fails to delight me- I absolutely love FA books! If you haven't taken advantage of this program yet, there is still time- the program doesn't end until September 4th, 2012.